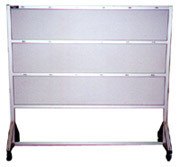 The industrial marketplace has used EAF's unique, a durable custom, aluminum presentation boards for many years. Our Presentation Board, design, construction, and after-the-sale support have been the standard at many General Motors factories, for example. Let us use our wealth of knowledge and experience to manufacture the "right" presentation board solution for your company. Shelves Facing Opposite Directions for Usage Both Sides. Hooks to Hold 18 Clear Shop Ticket Holders. Applications: E.A.F., Inc. is dedicated to the Design, development and Manufacturing of Rigid Modular T-Slotted Aluminum Profile Frames for Presentation Boards. 6 Ft. X 4 Ft. Custom aluminum fabricator and manufacturer of aluminum profile structures. Suppliers of custom/standard t-slotted aluminum profiles, extrusions, aluminum hardware components. Manufacturers of industrial safety guarding, OSHA yellow machine guarding, perimeter guarding, display/message bulletin boards, tag boards, presentation boards, salon equipment, industrial enclosures, CMM enclosures, and environmental enclosures. Industrial aluminum carts and storage-tree carts for material handling and storage/utility, industrial cabinets, tool storage cabinets, industrial part storage cabinets. Custom fabrication of industrial workstations, assembly stations/tables, inspection stations/tables, gaging stations, test stands, industrial computer workstations. CAD drawing downloads are available for many models. EAF is an authorized Fath Components distributor. Custom metal fabrication, CNC machining, milling, turning, water-jet cutting, laser cutting services, tube forming, tube bending, and packaging and crating services available.